Design: A flag divided into two horizontal halves with a copper five-point star placed in the middle. The top half of the flag has 13 yellow and red stripes that resemble sun rays, and the lower half of the flag is solid blue. Meaning: The blue in the flag is the same blue found in the American Flag, and represents liberty. The red and yellow strips were the colors of the Spanish conquistadors who explored the land of Arizona in the 16th century. The stripes are also meant to represent a beautiful Arizona sunset, and there are 13 of them to symbolize the original 13 colonies of the U.S. The star in the middle is colored copper to signify that Arizona is the largest producer of copper in the United States of America. The flag of Arizona was created as a result of the 1910 National Rifle Matches, two years before Arizona officially entered the union. These shooting matches started occurring around 1907 and were a very prestigious event at that point in time. Members of the Arizona Rifle team realized that all of the other state rifle teams carried flags with them. The Arizona team had no had no flag, and brought this to the attention of their team captain, Arizona National Guard Colonel Charles Wilfred Harris. Colonel Harris got together with Carl Hayden, the first Arizona Congressman who would eventually become a U.S. Senator as well, and came up with a design for a flag that would contain signs of Arizona's historical values. Colonel Harris's wife sewed a physical version of their design, and the Arizona Rifle Team carried their new flag to the National Rifle Matches the next year (1911). In 1912 Arizona joined the union, and Colonel Harris became the Adjutant General of Arizona. He designed a flag for the state of Arizona that was extremely similar to the flag that he designed for his rifle team. 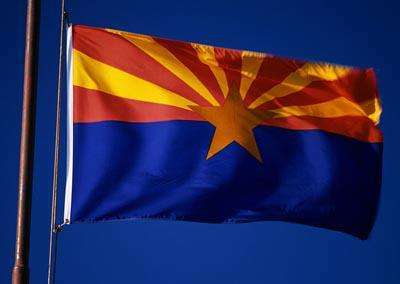 The flag was officially adopted on February 17th, 1917, by the 3rd Legislature of Arizona and has been the flag of Arizona for 97 years. In 2001, the North American Vexillological (study of flags) Association identified the Arizona flag as one of the "10 best flags on the continent", ranking sixty out of 72 North American flags.